By providing the necessities for anyone serious about mountain biking and also requiring the portability of a folding bike, this mountain bike has everything you will need. The Shimano Deore 20 speeds and the FOX Performance FIT4 three adjustable front suspension ensures the possibility of plenty of off-road riding, and the folding frame design means you are going to have plenty of options for transporting or stowing this bike. FOX Performance fork, Shimano Deore groupset 20 Speeds, 11.6kg. 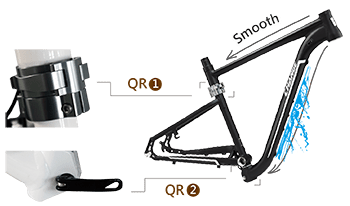 The Only folding frame achieves MTB frame safety test ISO 4210. Lightweight version of FOX's patented FIT4 cartridge system provides three on-the-fly compression damping positions—Open, Medium, and Firm—to adapt to varying trail conditions. Open Mode - Open mode has the lightest low-speed compression damping of the three modes. Open mode offers the most plush ride to ensure optimal traction over varied terrain. 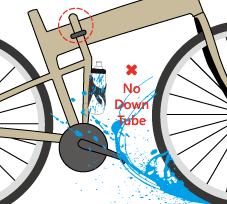 Medium Mode - Medium mode offers less compression damping than Firm mode. Use this setting when pedaling on undulating terrain, and for preventing excessive travel in technical riding situations (such as low-speed drops). Medium mode is a great all-around setting for most terrain types and riding styles. Firm Mode - Firm mode is a very firm low-speed compression setting. This setting is most useful for climbing and sprinting. The new DEORE has been achieved and is the group of choice for many different bikes and riding styles. From cross country to trail, from hardtail to full suspension, DEORE has something for every need. What’s more, DEORE components are top quality and highly durable.